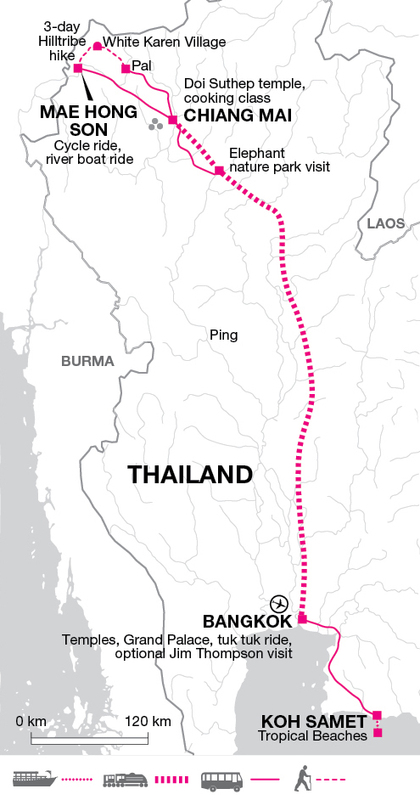 Travel from Bangkok's bright lights to the tranquillity of Thailand's northern hills. This active teenage trip is designed to combine a taste of traditional local life, staying in bamboo stilt-houses on a hill tribe trek, taking a river cruise and seeing elephants in a rescue centre. No trip to Thailand would be complete without spending time relaxing on its tropical beaches on the island of Koh Samet. Arrive in Bangkok and check-in at your hotel. The rest of the day is free. You may choose to take an optional cruise along the city's Klongs in a traditional longtail boat. This is the ideal way to explore Bangkok's network of meandering waterways that branch off from the main channel of the Chao Phraya River. Traditional houses back on to the water which provide some insight into local life. Keep a look out for monitor lizards and there is a fun opportunity to feed the many fish which reside here. After a leisurely breakfast our sightseeing tour begins by tuk-tuk. A fun way to get around the city, the tuk-tuk is a firm favourite with kids and a great way to experience Bangkok. After a short drive, we arrive at the Grand Palace. The sheer scale and vibrant colours can't fail to impress as we learn about the Thai Royal Family before walking on to Wat Po - the Temple of the Reclining Buddha. After spending some time here we return to the hotel for some relaxation. In the evening you may like to have dinner on a floating restaurant before visiting the vibrant night market in Khao San Road. The day has been left free to allow time for personal exploration or relaxation. Should you wish to take in more sights of the city a short walk from the hotel takes you to the water taxi's, a fast and fun way to experience Bangkok and its riverlife. A few stops will bring you to Jim Thompson's House, a beautiful teak building holding a stunning collection of antiques and fabrics. A short guided tour takes you through his life and significance to the capital after World War II. Following a visit here, why not take the sky train to Chao Phraya River where a further boat journey will transport you to Wat Arun (Temple of the Dawn). Alternatively if you missed the long tail boat ride on day 1 there is the opportunity to do this instead. After freshening up back at the hotel (several day rooms are provided) we arrive at Bangkok railway station where we board our air conditioned overnight sleeper train to Chiang Mai. In contrast with the heat and bustle of Bangkok, the climate in Chiang Mai comes as quite a relief. The town is situated in a high valley at the foot of the majestic Doi Suthep Mountain. Founded in the 13th century, Chiang Mai is a city with a rich, colourful and turbulent history. As capital of the Lanna (Million Rice Fields) Kingdom, this area remained outside the rule of Bangkok until well into the 20th century. Upon arrival we take breakfast in our hotel before driving to the famous Doi Suthep Temple, where we learn that the location of the temple was chosen by... an elephant! The king's favourite white elephant was left to wander with a Buddha relic strapped onto its back - the monarch having decided that where the elephant stopped, a temple would be built. We then return for an orientation walk of the town including various markets. In preparation for our hilltribe trek, there will be a short briefing from your tour leader tonight. Leaving Chiang Mai we head into the northern hills to spend the next three days exploring the area of the hilltribes where colourful tribes people inhabit the mountain slopes above an altitude of 300m. There are numerous individual tribes, each with its own particular beliefs, way of life and colour of dress. Our 4 hour morning transfer is punctuated with several stops including a tea making cafe where we watch the grinding of the leaves and can sample different flavours. We continue on and have lunch in the small town of Pai before driving to the start point of our trek. Here we are met by jeeps which take our overnight bags to the village, we just carry our day bag during the walk. Our trekking journey begins in the afternoon when we hike to a Red Lahu Village (approx 3 hrs walking), where we spend the night. The walk takes us through beautiful open scenery and we regularly stop to look at the flora and fauna or watch the locals at work in the fields. The pathway is clearly defined as we climb and descend three hills. Our Tour Leader carves bamboo walking sticks for everyone, these prove a real asset particularly with the uphills and river crossings. Once we arrive at the village we are taken to our sleeping quarters. The group is housed communally in one room with another room for cooking and eating. Foam mattresses, pillows, sleeping bags and mosquito nets are provided. After dinner we are greeted by traditionally dressed local children who sing several songs and then expect us to sing in return! It is a nice gesture to offer them sweets or small toys which you may have picked up in the markets of Chiang Mai. After a satisfying dinner, the ladies of the village provide a wonderfully soothing massage on tired muscles and help us drop off to sleep. This morning we have time for a quick tour of the village before heading out on our days trek. The scenery today is less open and feels more wooded and shady. A welcome relief from the hot sun. There are numerous streams to cross and stepping stones to navigate. We may come across water buffalo on our journey and a picnic lunch of sandwiches and fresh fruit is provided by our crew. Firstly however they must make the table! This they do by cutting down bamboo, a very versatile material which serves as both a table top and legs. This afternoon our walk brings us to Tham Yao Cave. A vast and pristine cave system which provides a home to hundreds of bats. Our second village is a little less basic than the previous night; a local shop in the village selling ice creams is a very welcome sight after our days walk. Again we are all accommodated in one village house but we are split between several communal rooms here with bedding as described above. There is a basic bucket shower and several toilets and also the opportunity to charge phones/cameras. Our final morning of trekking is a little more relaxed as the majority of the route takes us along the river. Splashing though the water and skimming stones on the river is a perfect end to our trekking adventure. After a couple of hours walking, we arrive at our third and final village. A celebratory cold drink is much deserved as we finish this element of the adventure and bid farewell to our trekking crew. We board our bus and drive on to our lunch stop before continuing to Mae Hong Son. Although over half the population of Mae Hong Son are from the various hilltribes, the town's location gives it a distinctly Burmese feel. It was only linked to the outside world by a paved road in the late 1960's. Our hotel is located in a tranquil setting next to the river and surrounded by mountains. The rest of the day is free to relax by the hotel pool. This morning we have a short cycle ride visit a temple which sits above the town offering expansive views of the surrounding area. In the afternoon, we then take a boat ride along the scenic River Pai. Similar in design to the long tail boats in Bangkok, they travel down the river giving the opportunity to spot colourful birdlife along the way and watch local people doing their daily chores. The afternoon is free for more walks, cycling, a mud spa or you may choose to relax and enjoy the facilities of the hotel. Today we return to Chiang Mai, the scenic bus journey will take around five hours including several stops plus lunch. Your main luggage will be waiting for you back at the hotel and the rest of the day is free. Later this afternoon we offer an optional Thai cookery class. You will meet your chef in the local market where he will explain and purchase the necessary ingredients, before being transferred to his kitchen (approx 30 mins). This is a stunning open air building which houses countless cooking stations. Everyone is encouraged to cook independently with children and parents working alongside each other. Each dish is demonstrated, before you then have a go yourself and whatever you produce is your dinner for the evening. The setting is stunning and provides a lovely cool environment. After dinner you are returned either back to the hotel or to Chiang Mai night market for a bit of bartering. This morning we head out to the Elephant Nature Park Sanctuary which is one of the largest elephant conservation centre in the country and also hosts an elephant nursery and hospital caring for sick and abandoned elephants. Its main functions are for the treatment and care of elephants although visitors and tourists are now admitted. We will feed the elephants from a viewing platform in the morning and in the afternoon we walk with the centre's staff with the elephants to the river that skirts the park. Bathing these gentle giants as they splash around is a real highlight with the opportunity to go into the river with them or watch them on the river bank. The day is all about spending quality time with these gentle giants and observing them being with the herd. We say goodbye to the elephants and travel back to Chiang Mai where we prepare for our overnight sleeper train back to Bangkok. Our train arrives in the early morning into Bangkok where we are met and continue by minibus (3-4hrs driving) to Ban Phe port for the ferry to Koh Samet. We should arrive on the island around lunch time with the afternoon free to relax. The hotel has several pools and is located right on the beach front. Only 6 km in length, Koh Samet is home to some of the best beaches in Thailand. White sands contrast vividly with the clear blue sea that laps the tree-lined shores of this idyllic island. Up until the 1980's Ko Samet was home to a small community of fishermen when the island then became a designated national park. The island still retains some of its original charm which you can experience for yourself over the two days that we are based upon the island. Relax and enjoy this tropical paradise, with the opportunity to do as much, or as little as you want. Today is left free to explore/relax. You may just decide to enjoy the pristine beach, cooling down with a swim in the clear waters of the Gulf of Thailand. Alternatively you can take an optional boat trip to one of the nearby uninhabited islands. Watersports and snorkelling can all be arranged locally. The Queen Turtle Conservation Project is also a possible optional visit. Evenings can be spent in the beach front restaurants which are within close proximity to our hotel and specialise in freshly caught seafood dishes. After a final morning on Koh Samet, we head back to Bangkok. Please note, the trip starting on the 14th August 2016 has a flight back to the UK on Sunday morning at 1.10am arriving that day into London Heathrow. The hotel night for Saturday the 29th August has been booked for all clients. If you book a flight departing on the morning of the 30th August, Explore will still provide an airport transfer. Bangkok - Longtail boat excursion on klongs 1500THB (approx £30) - this is for the boat, per person cost is dependent on group size. Breathable waterproofs made from material such as Goretex not only protects against rain and wind but also stops you from overheating. They 'breathe' and avoid condensation which you will experience from nylon waterproofs. Ponchos can be purchased locally at a cost of approx £3. Your Tour Leader will be able to advise of this. If travelling during the dry season (March to May) you should not need to bring waterproofs. We recommend a thick sweater or fleece jacket as nights can be cold in the hilltribe area in the cooler months (Nov-Feb) . Make sure that your waterproof jacket is loose enough to wear over your sweater or fleece. If travelling during the warmer months this should not be required. For everyday walking, light cotton trousers or long shorts are the most suitable. Jeans are not recommended. Long trouserskirts are also required in Bangkok during the temple visits. boots, make sure that they are worn-in and comfortable before the start of the trip and we recommend that you wear/carry your walking boots as hand luggage on the international flight: should your luggage be delayed, your well broken-in boots will be irreplaceable. This should consist of a main piece of luggage and a daypack to carry your personal day to day items such as sun cream, camera etc. You will also need to bring a holdall or kitbag for the trek as your main luggage will be left behind for four nights (two nights in the villages and two nights in Mao Hong Son). You will not be expected to carry this with you while trekking but it should be as light and compact as possible. If you pack bits and pieces in plastic bags inside your kit bag they will stay dry in case of rain and it will be easier for you to sort through. Remember, the less you have to unpack in the evening, the less you have to repack each morning! A bin liner to pack inside your daypack is also a good idea. A light sleeping bag or blankets will be provided on the trek. If you prefer to sleep in your own sleeping bag then we recommend you bring a 4-season (temperature -5°C to 0°C) sleeping bag for November to February departures. 2-season (temperature 0°C to 5°C) for the rest of the year. A sleeping sheet liner (silk) can be useful in both hot and cold conditions. A mosquito net is provided while on the hilltribe trek. Water along the trail must never be considered as drinkable. Take a 1.5 litre personal water bottle. Our support crew on the trek provide sterilized water each meal time to replenish your supplies. Also energy snacks (nuts, cereal bars etc.) are recommended whilst on trek. There are plenty of opportunities to swim. A good pair of sunglasses are essential for protection against UV rays. Bring suncream (Factor 20 or more) to protect your skin against the sun. A combination sunblock/ lipsalve is ideal for facial protection. A small torch is essential during our stay at the village houses, a head torch is probably best. Remember to bring some spare batteries. Try to keep cosmetics to a minimum. Essentials are toothbrush/paste, soap, small towel. Wet wipes are great for a quick clean up. For this we suggest $25 per family member. The hotels on this tour are comfortable and well suited to families. Some provide inter connecting or triple rooms, whilst they all have wifi, swimming pools and offer generous breakfasts. Each are well located and provide a good base for the tour - the hotels in Bangkok and Chiang Mai are centrally positioned, whilst in Koh Samet we stay in bungalows right by the beach. In Mae Hon Song the hotel is a few minutes drive from town and is located in a tranquil setting by the lake. 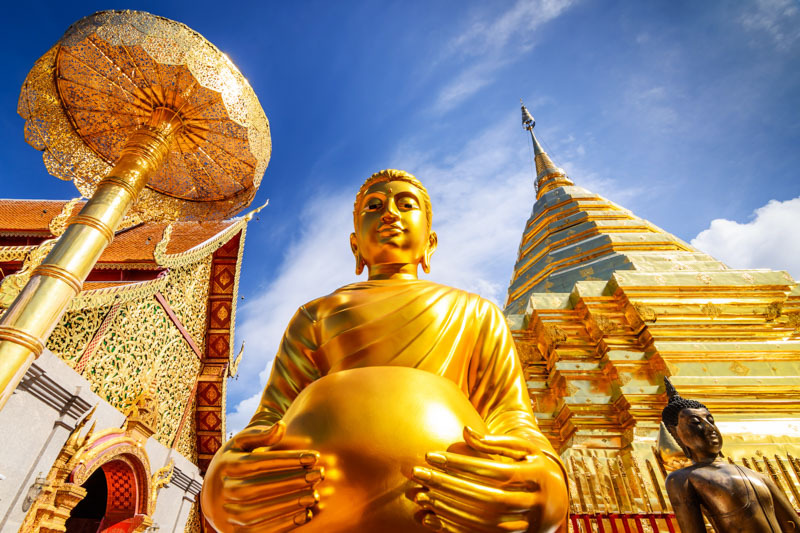 Glittering temples, remote hill tribe villages: Discover a Thailand off the tourist trail with soaring peaks and steaming jungles, tumbling waterfalls and vibrant cities; all set against a back drop of a traditional way of life. Thailand is quintessential Asia and one of our longest running family tours at Explore. From the bright lights of Bangkok to the peace and tranquillity of the northern hill tribe villages, there is such an incredible diversity of attractions and so much to offer families of all ages. The trip ends with three nights on the pristine white sandy beaches of Koh Samet. Families will love this tour for variety on offer. Trek through the jungle, take an overnight sleeper train from Bangkok to Chiang Mai meeting locals along the way, visit spectacular temples and put your cooking skills to the test as we take part in a Thai cookery class. An actioned packed two weeks of adventure in the Land of Smiles. Triple Rooms: This trip allows the option for triple rooms to be included within the booking on all nights of this trip with the exception of overnight trains and the homestay nights near Chiang Mai on nights 5 and 6. If you would like this option, a discount may be applicable on the cost of the trip - please ask our Sales team for further information. Average Age: As a guide we have identified the actual average age of the children who have travelled on this trip over the last 5 years, to help you decide whether it's the right one for your family. The average age on this trip is 13 years old; this trip is suitable for secondary school age children 11 and over due to the physical nature of the trekking in northern Thailand. This tour allows families who are interested in walking and also meeting the local population to experience a homestay and trek to some of the most colourful ethnic minority villages in Thailand. This is combined with time in the capital and the ancient city of Chiang Mai along with a few days on the beach to rest after your adventure. A special mention needs to go to our visit to the Elephant Nature Park Sanctuary which is one of the largest elephant conservation centres in the country plus one of the few that have passed Explores policy on animal rehabilitation centres. Your family get the opportunity to feed the elephants and walk with them to the river.